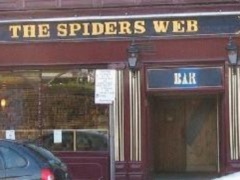 The Spiders Web, Edinburgh, EH3 8DT. The Spiders Web pub review, map and rating. Looking for a Hotel near The Spiders Web? Saturday 27th of Oct 2012 we have the Revolutionaires rockin blues band play the Spiders web pub plus several really good Rock n roll DJs, the doors open at 8.30 . This is the Halloween Party night so it is not to be missed !!!!!!! On Saturday September 29th , 2012 we have The Tennessee Hot Shots band playing downstairs also DJs Archie and Gus starting around 8.30 . Then on Saturday Oct 27th , 2012 we have the Revolutionaires rockin blues band also starting around 8.30 .
and surf along side early 50s and 60s R&B , this promises to be a truly spectacular evening , starting at 8 .30 till around 1 .30 . Mary Jean Lewis and the Starlight boys will be playing at the Spiders web on Saturday the 17th of Dec 2011 , this is a top rockabilly night and will be held downstairs in the function hall , there will also be several DJs from different parts of Scotland and a special gest DJ from London on the night . Its a veruy lively pub at the weekend but really quiet the rest of the week. I have been to the Ska night a few times and enjoyed it saw a band called big fat Panda , they were great , the booze is pretty cheap and they have a lot of clubs and events on at the weekends downstairs in the fuction room. i went to the Rockabilly night a few times and i have to say the music was really good and I will be back at that next time its on. No food at the venue though but there is a chippy just up the road and they dont seem to bothered if you bring chips in with you to the pub . I know its a wee while away but we are gonna be having Mary Jean Lewis and her band playing at the Spiders web pub in September , as her uncle Jerry lee Lewis will be celebrating his 75 birthday and we are putting on a show in honour of the great man. The show will also have top DJs including Tojo playing records before and after the band. I have been in this pub on many an occasion & quite enjoy it. It is an early-licensed pub so I think every visit that I have made to this pub has been betwee the hours of 6am - 11am lol. The staff are nice, the clientele is that of regular customers and they always appear to be having a bit of banter & enjoying themselves. The selection of beers on tap is fine & the price is good.